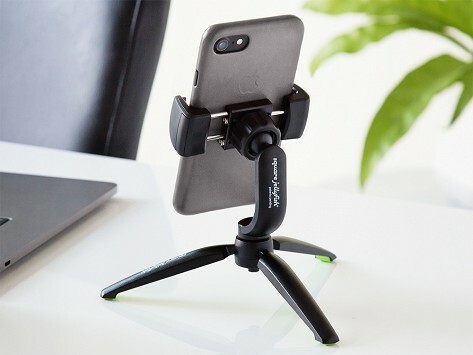 This compact tripod mount gets a grip on phones up to four inches wide to give you the best hands-free view of the screen. It’s perfect for spots like a desk or countertop and it folds down to easily stow away or take along with you. It can work with the Square Jellyfish wireless charger, too, to double-up on functionality. Guaranteed to last a lifetime. Dimension: Mount: 3" x 2.25" x 2.25"; Tripod closed: 4.5" x 1" diameter; Tripod open: 6" x 8" x 1.5"
Love, love, love this product. Holds iphone securely...legs are nice and long...love it!!!!! Well designed & well made clasp for holding your phone. Tightens for strong hold. Love this ! Works great when I am watching sports and TV on my phone or for FaceTime with the kids. It also works good for pictures. Love,love,love this product!! It really makes reading a recipe off my iPhone very easy! !